The hardest part, or perhaps fussiest, was sewing the zipper. 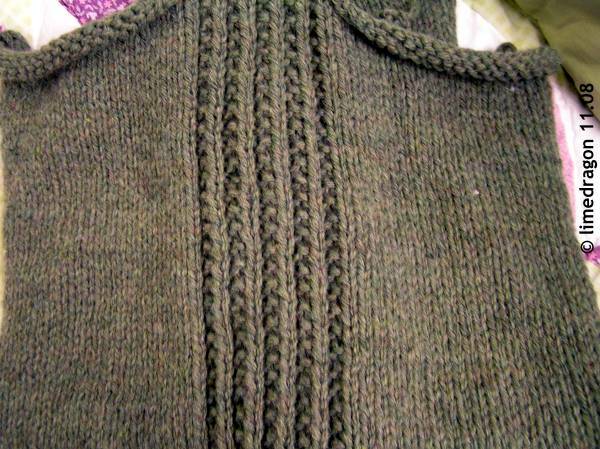 But thanks to the class I took during Stitches Midwest 2006, I was fairly confident with the process. I’m very pleased with how it turned out. I chose to use a black plastic zipper because the only metal ones I could find were brass, and I didn’t like them. If I’d had more time, I would’ve ordered online. 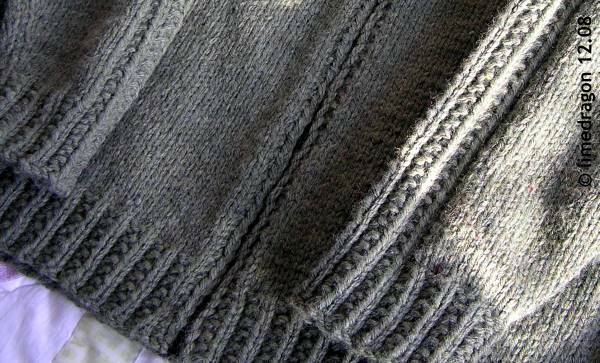 I changed only one thing… I used a chain stitch selvdge along the front halves because I liked how it matched the knit columns in the farrow rib. I kind if wish I had just kept the 2-stitch garter selvedge, to reduce the curling tendency. It does look nice when zipped up, though. 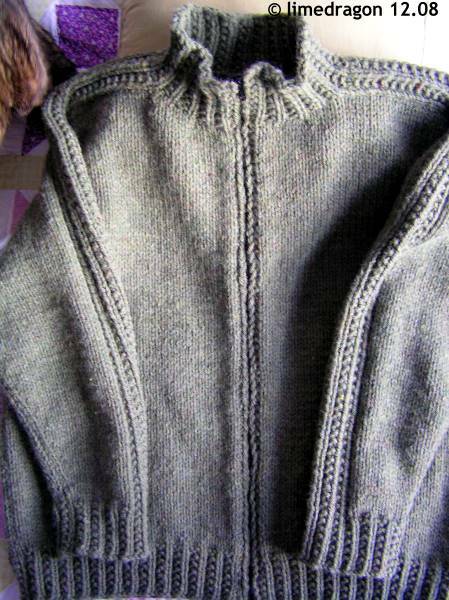 These pictures are all terribly washed out as I had finished attaching the zipper on the 24th and quickly snapped some photos before gift-wrapping the cardi. The color is a bit better in the sleeve progress photo below. That’s really a good-looking sweater! Wow, I really like the lines of that sweater! That’s lovely. I’d like one of those for myself. You may have to make a zipper tutorial for me! Fabulous! That’s a classy looking sweater. Oooh, i really like the way that cardi looks. it’s so, hmmm, manly? it’s great! gorgeous cardi! 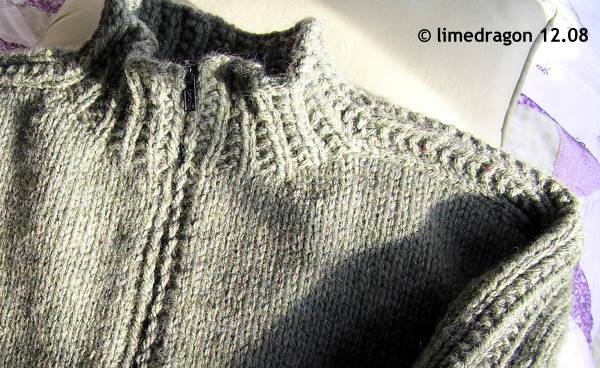 i love the yarn and the design is so streamlined. well done! Great looking sweater. I love the colour. And it’s great that you were able to put in the zipper yourself – way to go! !